A reliable source for Laboratory Workbenches information and a resource for accessing leading Laboratory Workbenches and suppliers. A laboratory workbench, often simply called a lab bench, is a work table that provides the space and surface to conduct tests and procedures, store lab equipment, and create workstations for technicians or students in a scientific laboratory. These are used mostly in chemical and biological sciences. Surfaces are usually made of an inert material, as water and fuel sources are generally nearby or built in to the bench. A laboratory workbench surface can be built with a number of different materials, depending on the unique requirements of the customer. Some types of surfaces include edge-grained maple, self-edged laminate, PVC-edged laminate, composite resinwood, electrostatic dissipative (ESD) laminate, epoxy resin, chemical resistant laminate and stainless steel. Laboratory Workbenches A laboratory workbench, often simply called a lab bench, is a work table that provides the space and surface to conduct tests and procedures, store lab equipment, and create workstations for technicians or students in a scientific laboratory. 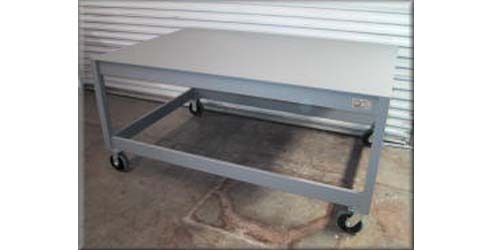 To aid in stability, these wheels usually come with heavy duty locking casters. Common materials are high-density polyethylene and an array of wood and metal. Shelves come in a few different forms, such as free-standing (folding or tubular), bottom, pull out or adjustable top. Other laboratory bench accessories include, but are not limited to, power strips, surge suppression plug strips, workbench frame plugs, upright sets, overhead lights, undershelf lights, footrests, bin box rails and panels. Cabinets may be built with corner adaptors, filler panels, modesty panels, apron drawers, apron fillers and powered back guards. To aid in computer usage, a lab bench may also be equipped with LCD holders, monitor holders, computer holders, lan stations and keyboard trays. Upon request, manufacturers will design bench legs to have adjustable heights. Certain laboratory requirements, such as no wood or volatile organic compounds (VOCs), are accommodatable. Speciality materials, like granite, may be available upon request. Laboratory benches are an excellent customizable option for all kinds of lab work, ranging from liquid mixing in a high school chemistry class, to recording sensitive patient information. 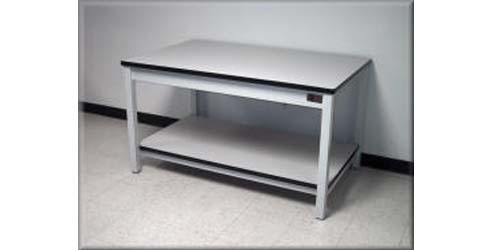 With the wide range of options available, a laboratory workbench can be customized for any purpose.